Five friends, a love of film and a suicide pact. In Tolkein lore, Astron-6 is the day of the Elvish New Year, and a new year is upon us indeed....From their first meeting at The Winnipeg Short Film Massacre, the five men instantly found themselves embroiled in a deadly game of cat and mouse. Rather than destroy each other, the sworn enemies decided to unite - and then destroy themselves (once famous). 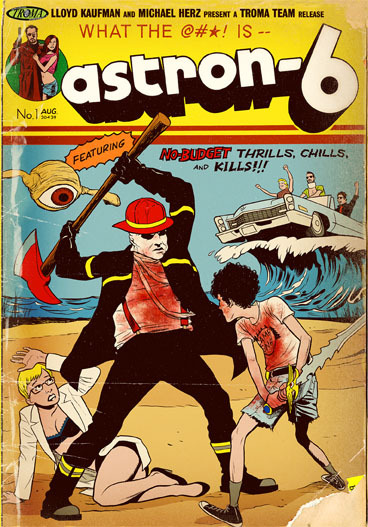 Astron-6 is the brainchild of these five iconoclastic, multi-media artists who share a fascination with the mechanics of fear and laughter. They subvert the expectations of the seasoned viewer with the nightmarish and absurd. Their imagery and recurring themes are often torn from the childhood of the irony-craving, internet savvy Generations X and Y. That is, they often lampoon genre films of the 1980s.